All along the Mid-Coast, cyclists can get their fill of grand panoramas along with a wealth of arts and entertainment offerings, historic lighthouses, quaint fishing villages, and museums and galleries. Called by some "the middle of nowhere," the town of Unity is really in the middle of everywhere—located centrally to Waterville, Bangor, Belfast, and Augusta! Home to numerous working farms and Unity College, Unity is proud of its rich agricultural heritage. All rides go around Unity Pond (actually a 2,528-acre lake), which is set in the midst of rolling farm country. Much of the lake is surrounded by marshes. In the old days, midcoast Maine was home to sailors, ships’ captains, and entrepreneurs who quarried the nearby islands for granite used to build many of this country’s great public buildings. Today, many of the grand old homes have been restored, and the rolling countryside offers glimpses of the Camden Hills and Penobscot Bay. The enjoyable 47-mile loop takes in the best of the region, from the bustling town of Rockland to the tiny, picturesque fishing village of Port Clyde. Light traffic, quiet country roads, and plenty of scenery make the Belfast area worthy of exploration by bicycle. The 21-mile ride is a fairly flat loop through the agricultural area west of Belfast. The 22-mile ride takes you up over Beech Hill with fantastic views of Penobscot Bay. The 30-mile ride takes you to Fort Point Lighthouse and back through the quaint village of Searsport. The 61-mile loop is for experienced cyclists. This ride originates from the coastal corridor, then meanders through rural Waldo County— an area that can only be described as a bicyclist’s paradise. he Boothbay Harbor region attracts visitors seeking natural beauty and a more relaxed pace than they find at home. The village of Boothbay Harbor retains all the charm and rich heritage of maritime New England, with traditional white clapboard homes. One of Maine’s most beautiful harbors, it is equally as breathtaking when viewed from the historic footbridge at sunrise, or from the deck of a friendship sloop as it rounds Tumbler Island. The scenery is simply spectacular. The Damariscotta area in midcoast Maine was once famous for its shipbuilding, which explains the buildings and exhibits that highlight the natural and social history of this fascinating place. Many villages have a working waterfront as well as moorings for pleasure craft. The views are spectacular; there’s something for everyone. A particularly interesting event is the alewives run in Damariscotta Mills in the spring. The scenery is magnificent. 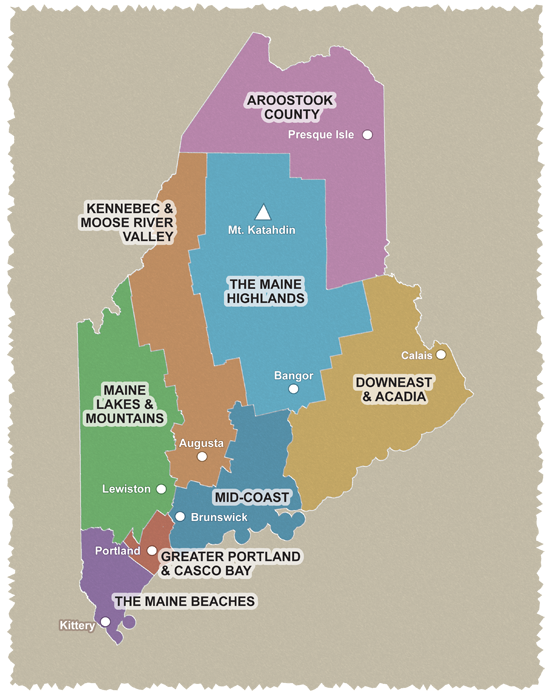 So is the history of the area that stretches back to pre-Revolutionary days when Maine was part of the Massachusetts Bay Colony. Site of the Popham Colony, Phippsburg was between 1607–1608 the first English settlement attempted in New England.